With plenty of family-friendly Halloween events designed especially for kids, dads, mums and even your pet dog, get ready to dress up, go trick-or-treating and generally have a frightfully fun time! While some scare events may not be suitable for young ‘uns, there are many family-friendly Halloween events with just the right amount of spooky to keep your little monsters excited. We’ve listed the cream of the pumpkin crop below. But don’t worry, Dads and Mums, we’ve also included some horror-fests for your late-night chilling date after you’ve put the kids to bed. Happy Halloween, everyone! This just in! 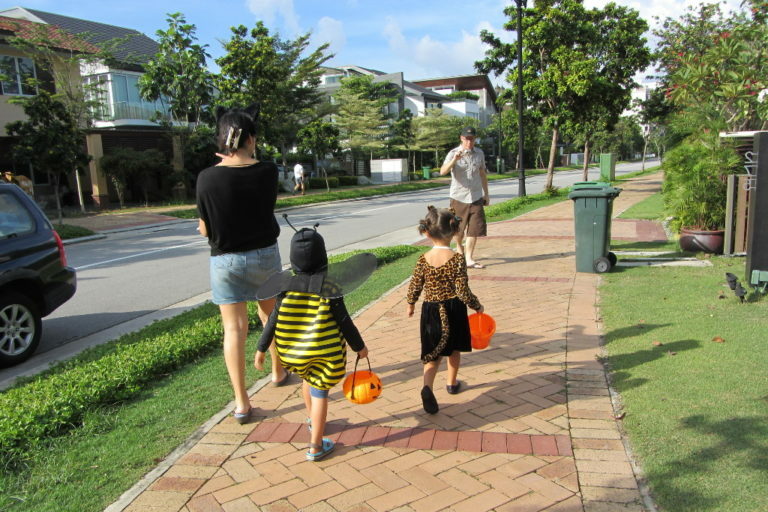 Holiday Inn Singapore Atrium has just launched a Halloween weekend staycation package targeted at families with kids. 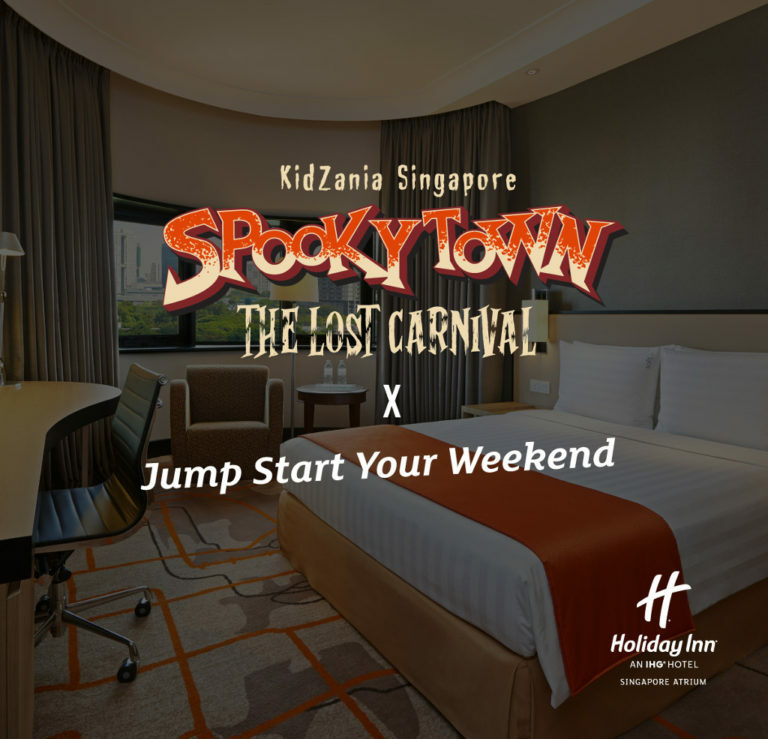 Guests who book this will receive three complimentary tickets (worth $129) to SpookyTown: The Lost Carnival at KidZania Singapore (see below for event details)! You’ll also enjoy complimentary breakfast for two adults, while kids below 12 years dine for free at Atrium Restaurant. Other perks include $20 dining credits, complimentary board games for loan, wireless Internet, smartphone device and parking. Bonus perk exclusive to SingaporeMotherhood readers: Quote “JumpstartMotherhood” to get a Puma or Nike Drawstring Bag, absolutely free! 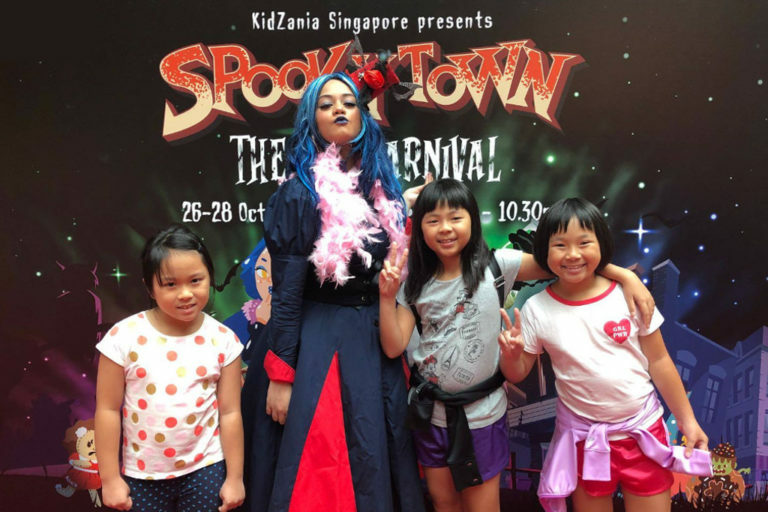 Gear the kids up for some spooky fun at KidZania Singapore’s inaugural Halloween event. When a mysterious explosion caused by SpookyTown’s famous alchemist, Dr SpookZ, occurred at its annual carnival years ago, everyone in town vanished except Mayor Fabiola. On eight creepy nights, he’s recruiting brave souls to help uncover the truth of their disappearance and solve the mystery of The Lost Carnival. Listen to Dr SpookZ’s tales, join street performances, take part in games and go trick-or-treating at SpookZ Alley! Dress your little monsters up in costume and let them loose in a culinary playground this Halloween. They’ll be baking up some Severed Finger and Spooky Spider cookies, as well as Graveyard and Oozing Brain cupcakes. The experts will also be showing them how to make Mummified Sausages and Jack O’Lantern Crunch Balls. 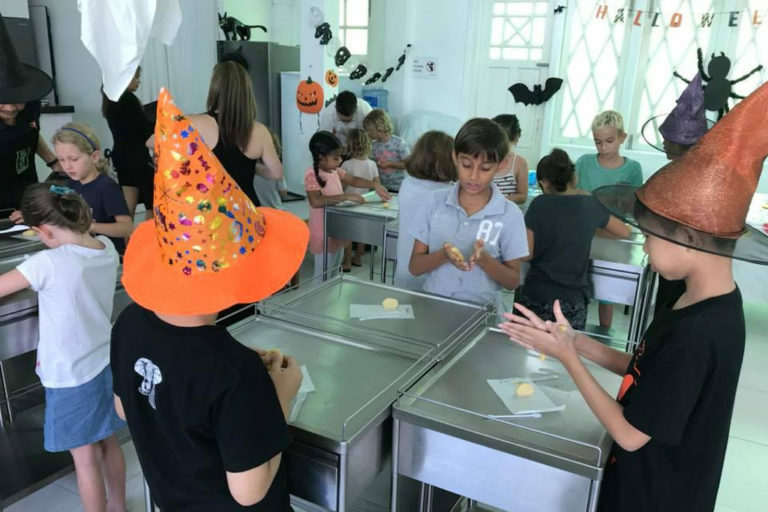 Along the way, the kids will learn food hygiene and skills such as chopping, measuring, kneading, and of course tasting! A Halloween-themed craft corner adds even more fun. Earth, Fire, Wind, Water! No, it’s not Captain Planet, but rather, the Asian Civilisations Museum’s (ACM) annual Halloween event. Discover how the elements are linked to supernatural beliefs via thrilling performances, paranormal talks and a movie screening. After listening to haunting tales by the river, unravel your own special element in a spooky trail. Kids and families can also make a souvenir to take home. Mystery prizes await the three best-dressed ghostly visitors too! Get up close and personal with S.E.A. Aquarium’s latest weird and wonderful animals in this year’s Spooky Seas event. 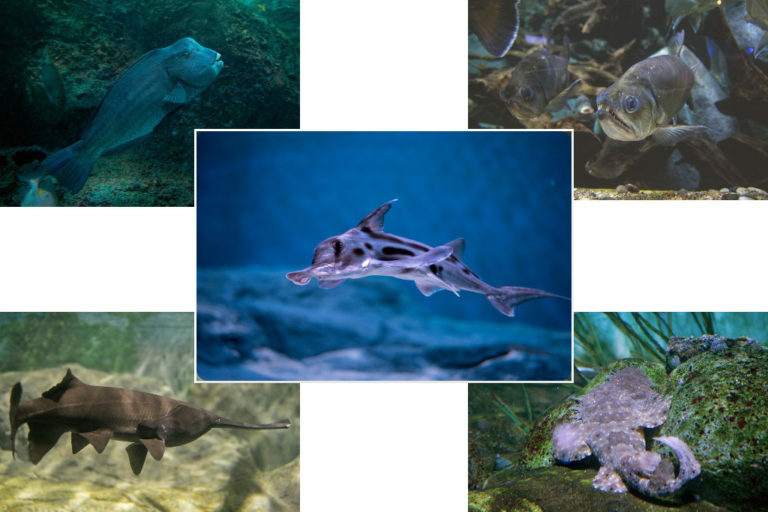 Meet the Elephant Fish with its trunk-like snout, the giant Bumphead Parrotfish that poops sand and has a parrot-like beak, the Amazonian Vampire Fish with sharp fangs, the freshwater giant Paddlefish with a built-in GPS ‘antenna’, and the Tassled Wobbegong Shark who’s an expert at camouflaging. Kids can take part in a scavenger hunt through various interactive stations, and don’t forget to get selfies with mascots Mai the Manta Ray and Sam the Hammerhead Shark! Three heartland malls in the east of Singapore are in cahoots to bring families a series of fangtastic activities. For starters, take part in White Sands’ Halloween-crafting workshops, dress-up party and movie screening night at the Pasir Ris Public Library. Over at Tampines 1, get your free Stylloween makeover done at SaSa, before exploring Alice’s Asylum (parental discretion advised), an eerie rooftop maze. 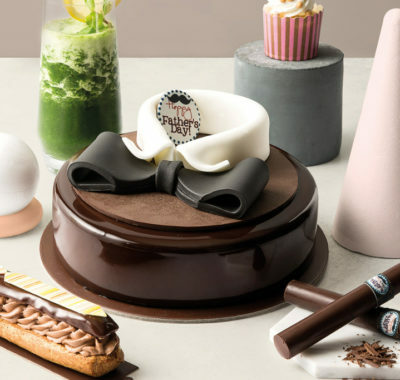 Finally, take part in Halloween-themed baking workshops at Century Square. 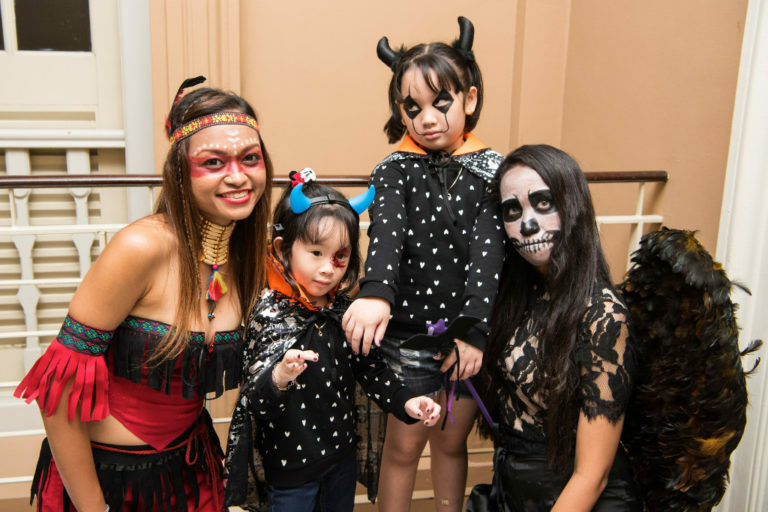 Kids up to 12 years in creative costumes also stand to win prizes, and the costume contest showcase includes a spooky tea party for everyone! Take part in arguably the most unusual run in town. Halloween by the Bay is a Pumpkin Run and Fun Walk for families and friends. Come dressed in your weirdest Halloween costumes and makeup and go on a treasure-hunting fun walk and run. You can even go on an extra unique 2.5-3km Pumpkin Run while lugging a 2-3kg pumpkin! Afterward, end the night at the Silent Party. Registrants will receive an event t-shirt, finisher medal and event bib. 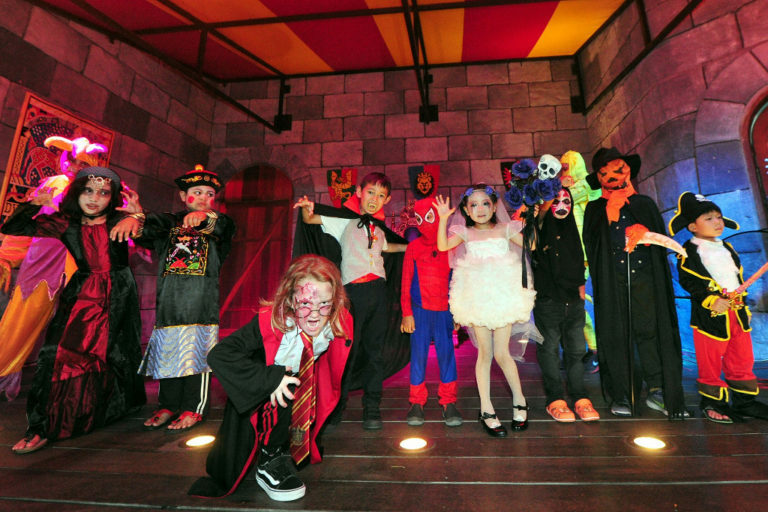 Specially for children aged 12 years and below, Halloween Thrills promises a spooky evening of nerve-wracking fun and laughter. 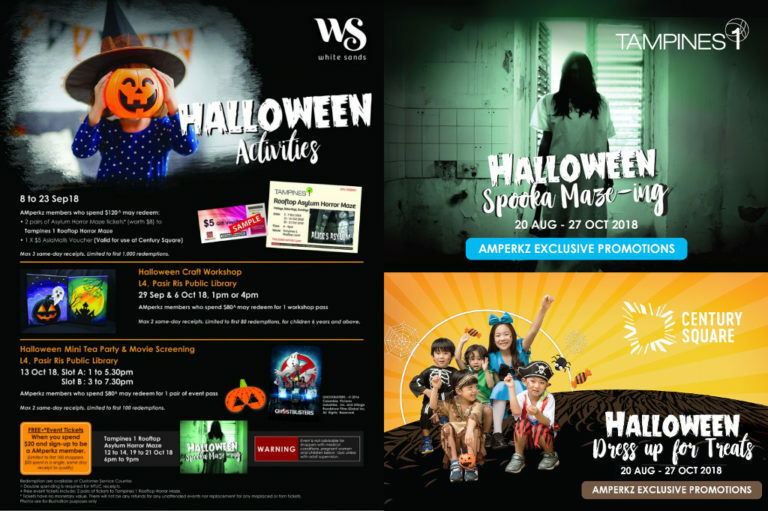 Pick up your Halloween Thrills card at Sentosa Cove Village, then begin the adventure. Tackle a Halloween maze at ONE°15 Marina, say cheese at a hair-raising photobooth at Sentosa Cove Village, and decorate a pumpkin at Quayside Isle. Collect all three stamps and stand to win some scarily good prizes. Participate in trick-or-treating, a best-dressed competition, and meet Frankenstein and Dracula too! Trick-or-treating can be tiring, but don’t worry. 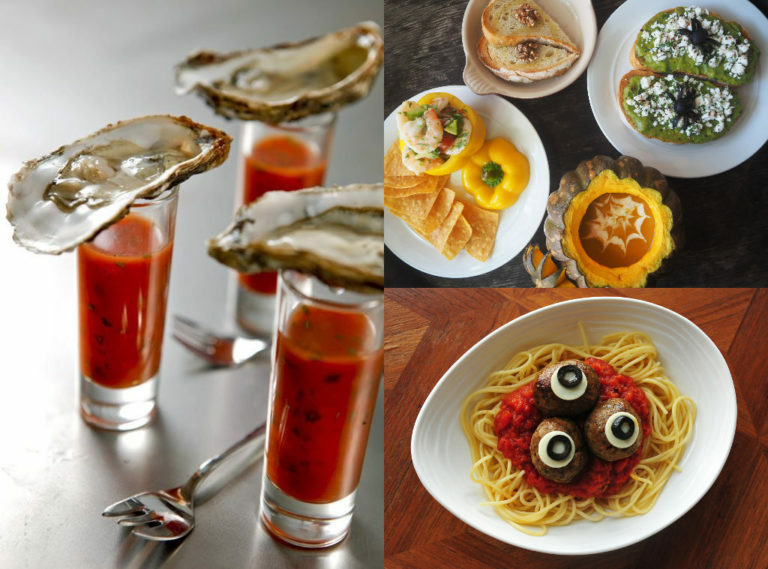 F&B establishments at Quayside Isle are preparing a host of special treats you can snag along the way. Shout “Trick or treat!” when dining in at participating outlets to get special candy treats. Those in spooky outfits also receive a complimentary O(yster)+ ‘Blood Shot’ at Greenwood Fish Market. Over at Sabio by the Sea, order up Halloween-inspired dishes and drinks, such as Frankenstein Sandwich and kid-favourite Spooky Spaghetti with Eyeballs. Does your family include a pet dog or two? Now you can include your fur-child in your family’s Halloween activities too! 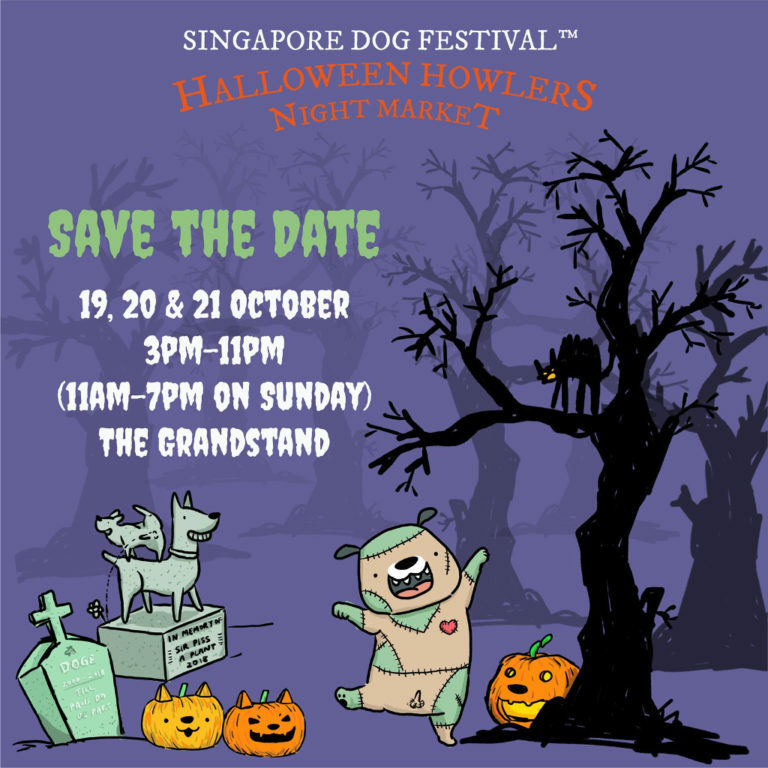 The inaugural Singapore Dog Festival – the first-ever Halloween-themed doggie night market – is sure to be a howling good time! It’s both child-friendly and dog-friendly, and will feature educational talks, sharing sessions and exciting activities galore. With both local and international dog product vendors on-site, even Rover gets his share of trick-or-treating! If jostling with other ghosts and witches isn’t your thing, why not take the kids to watch a movie? 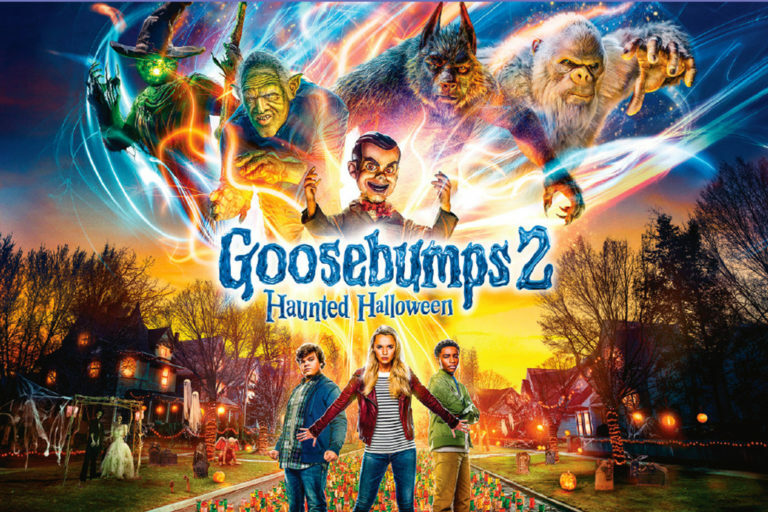 In the cinemas just in time for the season is Goosebumps 2: Haunted Halloween. Based on the popular Goosebumps book series by R.L. Stine, the sequel to the 2015 Goosebumps movie is equally chock full of laughs, adventure and monstsers. Alternatively, tuck the kids into bed and catch Jamie Lee Curtis as she returns in the latest instalment of the gory horror flick, Halloween (2018). 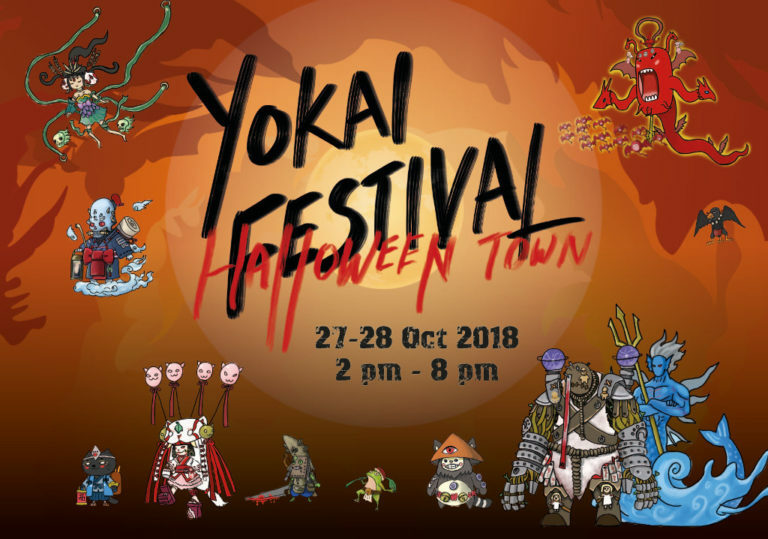 If you and the kids are into Japanese anime and cosplay, then head to Downtown East for the Yokai Festival. Don’t have a costume yet? Grab them at the first-ever ‘Last Minute’ Costume Fair (20-21 Oct). Return in costume over Halloween weekend (27-28 Oct) and win instant prizes in the Horror Dip. Other highlights include stage performances and activities, the Underworld (flea) Market, outdoor movie screening of My Neighbor Totoro, and the Yokai Parade. You can also register to take part in a foam-blasting duel of Yokai vs Humans, and complete missions to win prizes. Here’s one just for the grown-ups that of course needs no introduction. Singapore’s biggest annual Halloween scare-fest is back for its eight edition to bring infinite fear to all. Set to be bigger and scarier than ever, it offers five haunted houses, three live shows and two scare zones. 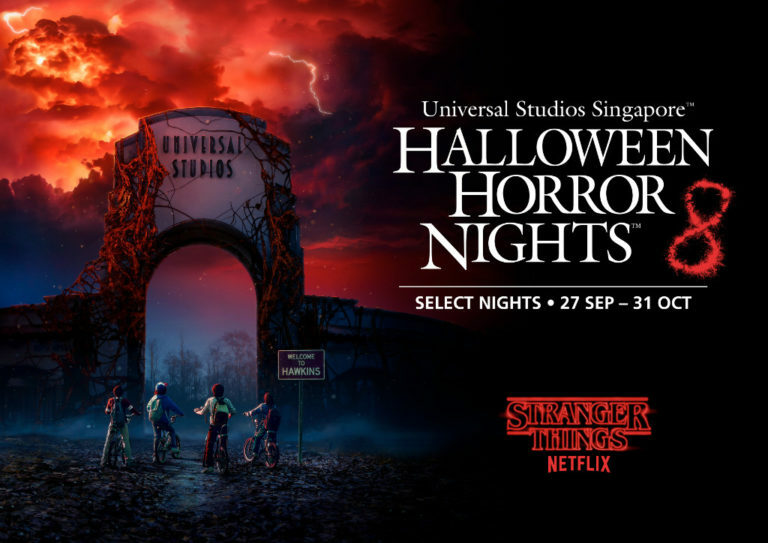 While four of the haunted houses comprise familiar Asian horror classics such as the Pontianak legend, the fifth and most highly anticipated is surely the haunted house featuring Netflix’s Stranger Things. Zombie Laser Tag is also back by popular demand in an arena twice as large as before! 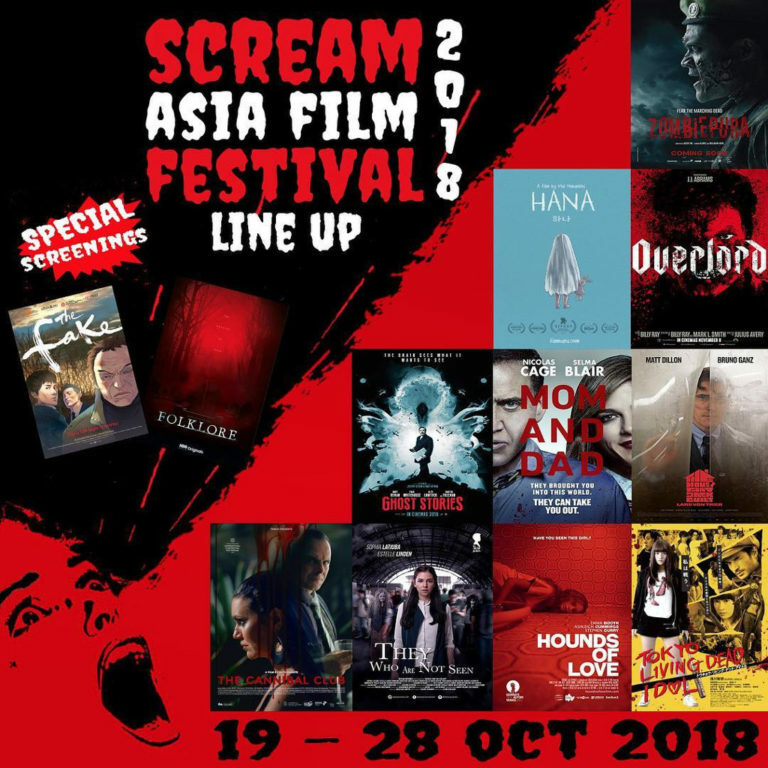 Another one to leave the kids behind for is Singapore’s first-ever horror film festival. Co-curated by local filmmaker Eric Khoo and Korean film programmer Jongsuk Thomas Nam, the 10-day festival opens with the world premiere of Zombiepura. The new Singaporean horror flick directed by Jacen Tan will resonate with all who have served NS in the army. Other films completing the international line-up are works of award-winning directors hailing from countries spanning Indonesia to Denmark. Acclaimed horror filmmakers such as Yeon Sang-ho of Train to Busan fame will also be conducting masterclasses. Do you really want to make your kid’s day? 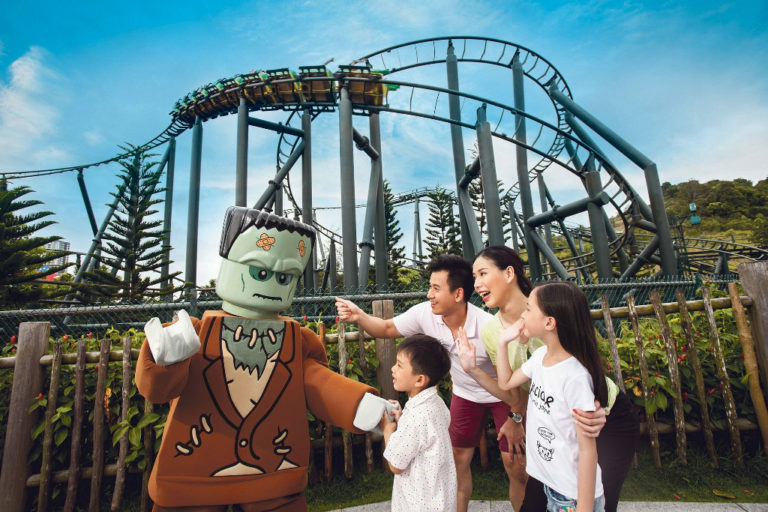 Then head over the Causeway to discover LEGOLAND’s spooky makeover and friendliest monsters! The whole park will be jam-packed with fun activities such as Speed Building Challenges that families can work together on. While running around to various checkpoints on the Hut Activity Trail, you might even run into your favourite LEGO characters. On Fridays and Saturdays, the park will be throwing the biggest Brick-Or-Treat Night Party. Kids in full costume enter free all month and those who complete activities stand to win prizes too! 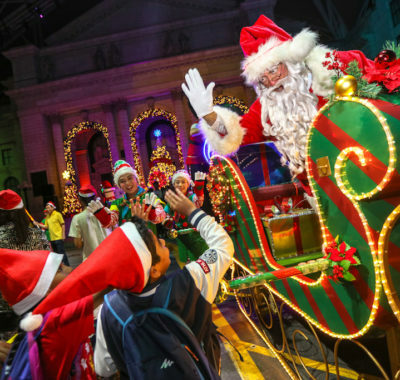 Christmas 2018: 18 Fabulous Festive Activities to Enjoy with the Whole Family!